These tracks are often walked in various combinations of a loop as they are in parallel valleys with the same start and/or end points. The Great Walk and serviced huts are generally comfortable with reasonable amenity, although they do have a winter season where the water to the inside taps is turned off, pipes are drained to avoid damage from freezing, instead you have to go to an outside tank. Any flushing toilets are also locked, you have to use a long drop. The Great Walk huts have the summer/winter pricing difference and the requirement for summer season booking. This doesn’t apply to the other huts which have the same price all year round and are on a first-come-grabs-the-bunk basis. Note that camping is only permitted at the official campsites although it is OK to camp for free a minimum of 500m from the track. The problem with this 500m limit is that there are few locations where it is physically possible to whack up your tent, the country is either covered in tussock, not easy to sleep on those massive lumps, on a considerable slope, on private land or all of the above. If it’s raining cats and dogs you take whatever shelter you can. A few reasonably sheltered camping spots are located around the hut. No one’s favourite hut, but it does the job. The best “official” campsites on the Rees Dart track are near Dart Hut. A five-star hut built in an almost five-star location. A surprisingly dry, if not dusty, alternative to a tent or hut for the adventurous. Not the most comfortable of bunks here, but good enough shelter whether or not you intend to climb Mt Earnslaw. Greenstone Hut is similar in style to the new Mid Caples Hut, ie, generous in space, firedoors on the two separate sleeping areas, double glazing, bigtime insulation, taps inside the hut, at least during summer, otherwise you need to go outside to the rainwater tank. And the big picture windows. Not much amenity here, no bunks, etc, just a three sided shelter at the carpark, 10km or so up a cul-de-sac from Kinloch. The Greenstone Saddle campsite, while sometime somewhat exposed, is otherwise just dandy, nice view, removed from passers-by but it doesn’t boast much in the way of amenity for your bucks, no kitchen shelter here, just the long drop. Harris Saddle Shelter is a simple shelter with a toilet, but on the positive side it is shelter. For those who like to sleep under a rock this is perfect accommodation. Lake Howden Hut has a lovely location on the outlet of a small creek from Lake Howden, at the junction of the Routeburn and Greenstone Tracks. Split level with bunks upstairs and decent living area downstairs. This is a great location, pity the artificially grassed sites weren’t more suited to the activity of camping, ie, not exactly level and somewhat lumpy. Well sited Lake Mackenzie Hut with a view to the nearby lake with Ocean Peak around to Emily Peak as a backdrop, and round to the left some peaks of the Darran Range some distance away. Just about as picturesque a spot as you could imagine. 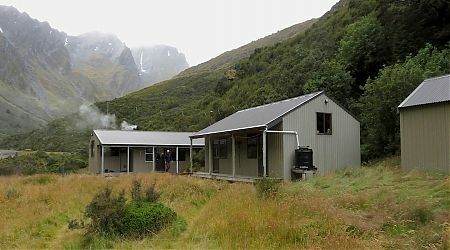 Recently renovated/extended McKeller Hut on a small river flat near the upper Greenstone River, not far from the lake. Adjacent to the actual Routeburn Falls the Routeburn Falls Hut is built on stilts with a grand overview of the lower Routeburn valley. Routeburn Flats campsite is a hugely popular summer camp site due to the proximity to Queenstown and the mostly flat walk in. 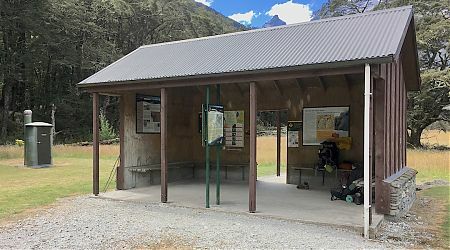 Routeburn Flats Hut is one of the two original huts still left on the track although it has been recently modified and with a large picnic verandah area added for the numerous summer daytrippers. A few camp sites scattered around near the hut are almost level, almost smooth, almost sheltered. Located at the bushline, the backdrop is way rugged, even if the actual climb to Rees Saddle a few kilometres away is not so tough. Steele Creek Hut might be renovated but it hasn’t been overdone. The concrete floor still doesn’t extend across the entire horizontal surface where it might be expected, the beech sapling structure has bark attached, the interior lining is still old fertiliser bags. Yes, plenty of character. The Divide Shelter is a simple shelter with benches, tables and toilets, and plenty of space to park cars and the odd bus or five.